It doesn’t rain often in Phoenix – the city I call home. The remnants of a Pacific hurricane made its way to our city. And it rained. The kind of cloudy, drizzle that kicks off Fall and makes you want to curl up with a good book – not work. That particular day, I found myself working on a tight deadline. The weather was so distracting that I found myself looking out the window more that I worked on my project. I began to search for ways I could improve my focus and productivity even while staring distraction in the face. While my mind wondered, I thought about a conference I went to several years ago where Erik Wahl, an artist, and motivational speaker spoke. In this particular presentation, he mentioned he practices something he calls “Crazy Daddy Day” with his children. The idea was that when their life got in a rut, he would unexpectedly put Crazy Daddy Day into effect. The only rule for the day is that everything happens backward including eating. Dessert first, then working their way into the spaghetti and meatballs and finishing with the salad and soup. Last week, Aleksander Olic published a post entitled A Different Kind of a Productivity Hack suggesting something similar. The post recommends doing things differently when you need a boost in your productivity. The concept behind both of these is change. By doing things differently – mixing things up -makes it easier and faster to accomplish your task. Here are some ways I use to get motivated. I share them to help inspire your creativity and get you out of a rut. Nilofer Merchant’s TED talk made a strong case for this type of one-on-one meeting style. Meetings taken out of the office have been shown to increase employees’ creativity and focus. Why? Perhaps just getting out of the office takes you out of the box, creating the environment for out-of-the-box thinking. It may be just getting the blood flowing to the brain or the change of scenery, but it does work. Merchant points out that we now sit for 9.3 hours each day which is more than the 7.7 hours we sleep each day. This sedentary lifestyle has been shown to cause blood clots and linked to some types of cancer and heart disease. Taking a day off from meeting gives everyone a guilt-free opportunity to get their actual work done, the ability to focus, and encouragement to start more ambitious projects. Just knowing that your day will not be interrupted by a meeting provides more mental focus. And, when your mind knows that the day will not be broken up, it naturally wants to focus on more daunting and challenging projects that require mental concentration and focus. Your agency won’t be alone if you implement this practice. You will be joining Facebook, Asana, and Kiva all of which have no meeting days in effect and have experienced a significant productivity boost. Sometimes, just changing the type of music you are listening to will change your way of thinking. When you hit the afternoon “I need a nap” frame of mind, pick up the beat. Higher beats per minute will increase your energy level. Also, classical music has been proven to increase brain function and improve performance. Another study showed that playing nature sounds in an office environment could improve your thinking skills and mood. Mix them all together and you end up with something I’m coining ‘Classirapture’! Or, better known as noise! We all love to play with stuff, so why not bring the stuff into the workplace. 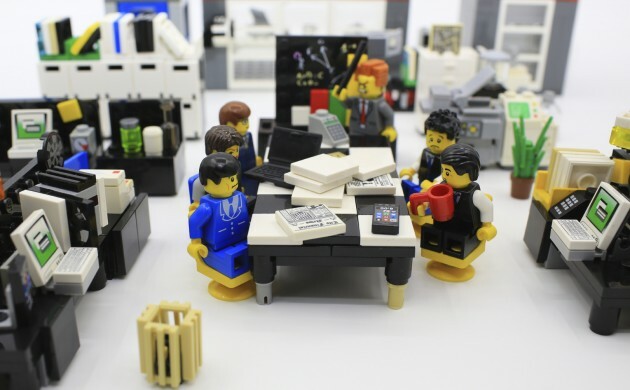 Lego is the perfect addition for any office because it is a low-cost creativity booster. There are those who may think Lego’s are childish and have no place in the work environment. Adding them to the environment has proven to help with problem solving and searching to solve problems. They are fun and inexpensive and can help with storytelling or to describe problems. These little blocks can deflect a lot of pressure and move your brain back to a more playful state. Creating physical models help people visually think about problem-solving. It is safe to say Lego itself is more stimulating and creative than a PowerPoint presentation or a spreadsheet. We often associate change with slowing us down due to learning curves and getting used to new processes or places. It is interesting that sometimes change can make us more creative and productive! We all have our secrets and tips that work for us.